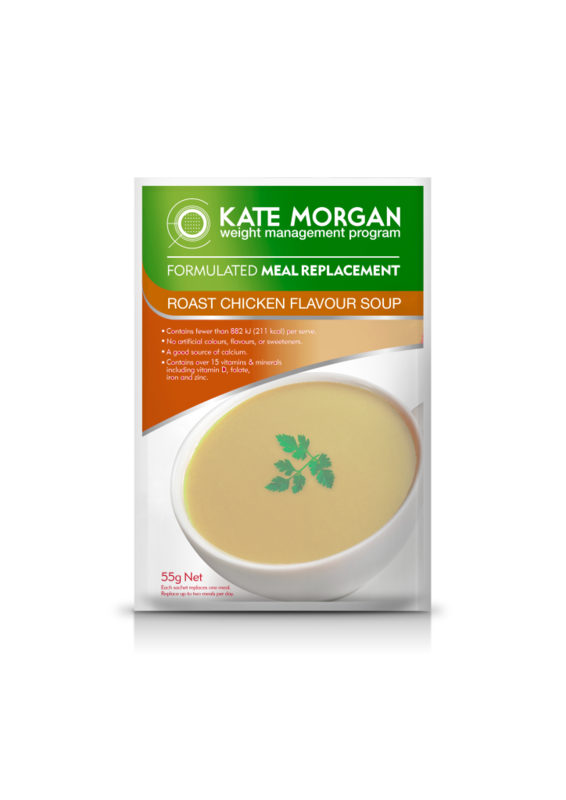 Kate Morgan Meal Replacement Soup sachets are heavily fortified with all of the vitamins and minerals that your body needs to stay healthy while you lose weight. They are part of a nutritionally balanced weight loss program and taste great, keeping you fuller for longer. Contents of one sachet replaces one meal. Add the contents of one sachet into a large mug. Add 200 – 250 mL of boiling) water. Stir until the contents of the sachet are dissolved. Add more or less water to suit your taste. You can also add allowed vegetables to your soup for extra flavour and healthy delicious soup. Maltodextrin, gelatine, beverage whitener (glucose syrup solids, coconut oil, sodium caseninate, mineral salts (340, 451, 452), emulsifiers (471, 481), anti-caking agent (551) acidity regulator (260), lecithin (322)}, potato starch, salt, roast chicken flavour, minerals (potassium phosphate, calcium phosphate, magnesium oxide, ferrous sulphate, zinc sulphate, potassium iodine), vitamins (C, E, niacin, A, D, B12, B6, B2, B1), folate), yeast extract, vegetable oil, onion powder, pepper, natural colour (100).